LOMERON, DAVID, merchant of La Rochelle, Huguenot; b. October 1591 at Chinon (France) or in the vicinity, son of Daniel Lomeron de La Martinière and Suzanne Georges. David Lomeron was the nephew of the famous La Rochelle merchants Samuel Georges and Jean Macain, who were partners of the Biencourt family, and who sent him to Canada in 1613. 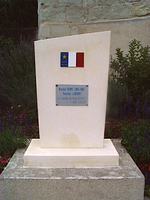 He took part in the disputes that set the Biencourts against the Compagnie de la Nouvelle-France. When Lomeron had returned to Port-Royal in 1615, Charles de Biencourt made him his chargé d’affaires. The following year they together seized the Ange-Saint-Michel, a ship belonging to the Compagnie du Canada. 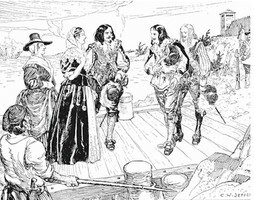 In 1617 Lomeron, while continuing to act for Biencourt, founded a society comprising Pierre Georges, a regular traveller to Canada, and Pierre Garat, who went there in 1620. Lomeron continued in his double capacity until Charles de Biencourt’s death in about 1623. After that date it is not too clear what became of him. In 1627 there was in existence near the Cap Fourchu (Yarmouth, N.S.) a post called Port-Lomeron, and Nicolas Denys stated that Lomeron for several years owned an establishment there, which was destroyed by the English about 1628. It is known that he worked for Charles de Saint-Étienne de La Tour between 1633 and 1636, but we do not know at what date he had entered his service. Lomeron seems to have left La Rochelle for good; he had married Jeanne Duquerny there on 5 June 1622. ACM, B, Amirauté de La Rochelle; E, Notaires. Denys, Description and natural history (Ganong). Robert Le Blant, “L’avitaillement du Port-Royal d’Acadie . . . ,” Revue d’Histoire des Colonies, XLIV (1957), 138–64. Étienne Trocmé et Marcel Delafosse, Le commerce rochelais de la fin du XVe siècle au début du XVIIe, avant-propos de Fernand Braudel (École pratique des Haute-études, VIe section, Centre de Recherches historiques, Ports-Routes-Trafics, V, Paris, 1952). Arch. en ligne, Charente-Maritime (La Rochelle, France), “Reg. paroissiaux, pastoraux et d’état civil,” La Rochelle, lacunes: réceptions 1620–1623, 5 juin 1622: charente-maritime.fr/CG17/jcms/cg17_34489/les-archives-en-ligne (consulted 23 May 2013). In collaboration, “LOMERON, DAVID,” in Dictionary of Canadian Biography, vol. 1, University of Toronto/Université Laval, 2003–, accessed April 20, 2019, http://www.biographi.ca/en/bio/lomeron_david_1E.html.